A trio of researchers, two with Universidade Federal de Santa Maria, the other Universidade de São Paulo, have unearthed the remains of three early ancestors of the giant dinosaurs that would later roam the Earth. 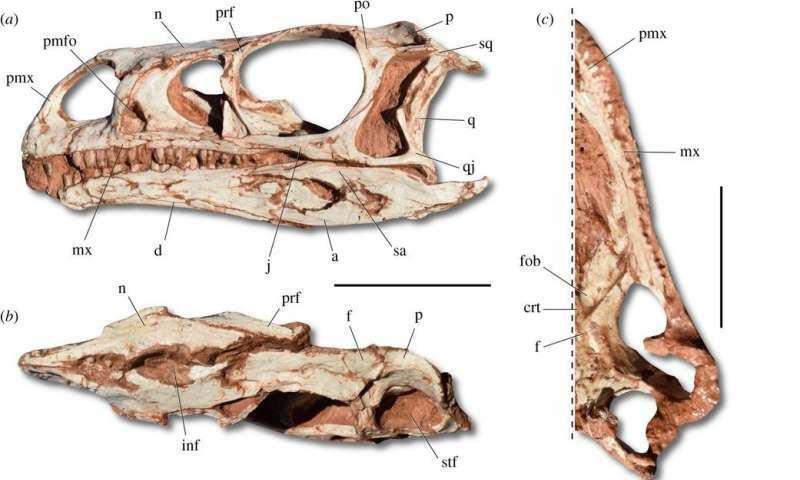 In their paper published in the journal Biology Letters, Rodrigo Temp Müller, Max Cardoso Langer and Sérgio Dias-da-Silva describe the three complete and very well-preserved dinosaur skeletons they uncovered in a southern part of Brazil. The skeletal remains have been dated to approximately 225 million years ago, putting them in the Late Triassic, or more specifically, the Norian. The researchers note that they were much smaller than their descendants, standing just five feet tall and weighing approximately 200 pounds—their heads were small enough to be held by a human hand. The remains represent a new species of dinosaur—they have been named Macrocollum itaquii, and are members of a clad made up of other members of the Gondwanan Triassic taxa. They were vegetarian and had very long necks, which allowed them to reach up for higher food sources. They also walked on just two legs. The dinosaurs trod the Earth during the time when Brazil was still a part of the supercontinent Pangaea. Prior research has shown that the most dominant type of vegetation during the Late Triassic was gymnosperms (plants with no flowers that produced seeds and cones) and ferns. A long neck would have allowed the dinosaurs to reach higher than other creatures that lived during the same time period, giving them an obvious advantage. The researchers report that the skeletal remains were found very close together inside five tons of rock and that they were very well preserved. They suggest that the fact that they died together indicates that they likely also lived together, evidence that the early dinosaurs were social creatures. They also suggest that the discovery of M. itaquii skeletal remains will fill in the evolutionary history of dinosaurs in general and sauropodomorphs in particular, perhaps explaining how their descendants grew so large. They note that fossils from early Norian rocks are quite scarce; thus, the find is likely to generate considerable interest in the archaeological community.